I wanted to do another illustration of Emma Cook for a while now. This British designer is amongst my favorites because of her subtle and humorous approach to fashion. Her collections are always pretty, feminine and wearable, but very far from ordinary. 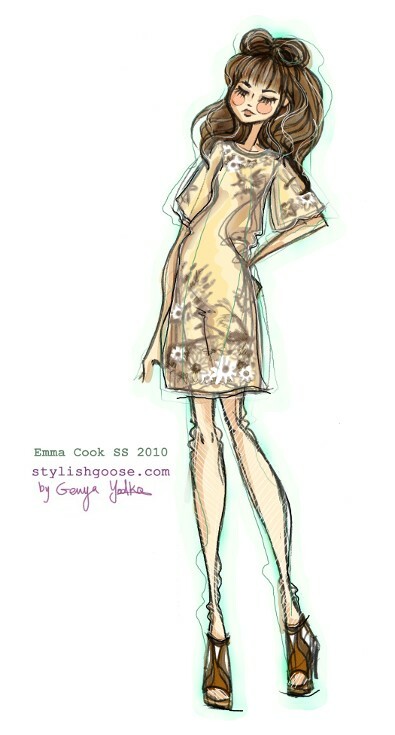 Emma Cook is known to incorporate wild elements from nature in her clothes. I think the little serious fox on this dress from her SS 2010 collection is fantastic. Thanks to Coy Concepts, my sister Anna who is a talented graphic designer, for preparing this scrapbook inspiration for me to illustrate from. A bit of the seventies, the wilderness, flower fields, and lots of style. Mouseover image parts to see credit details. Really love that dress! Your art is fabulous and so is the collage from Coy Concepts! Keep being creative! Genya- stunning outfit and the Gaga-inspired hair bow is key! Anna, I covet the owl necklace! Very Beautiful! The collage is so exciting! Looks very good. I must say: sometimes your work is much prettier than the original images!!!! Love, really love your work. 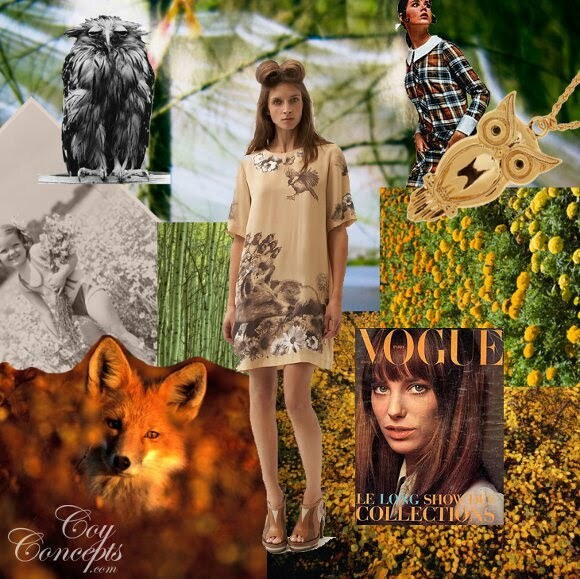 Love this illustration and the mood board- great collab! I simply LOVE your illustrations.. *-* No kidding, they're my favourite ones! thinking about writing a post about you! Hey, i love hair style. Thanks for the love you all! I love the hair too - it turned out kinda funky, but not too over the top. My gosh, that is fantastic. Bravo! I love your illustrations,and I love the unique style that they have. Check out my wrok on my blog! how come I never come across your blog before? your illustrations are sooo lovely I'm in love girl!